Coleus plants (Solenostemon scutellarioides) have the most spectacular eye-catching foliage. 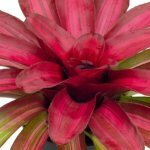 The colorful, velvety leaves come in a variety of distinctive shapes that may be oval or heart-shaped with scalloped or fringed edges grown on square stems. The foliage is a natural kaleidoscopic of beautiful, intricate color patterns in various shades of green with a mixture of red, bronze, cream, pink, maroon, yellow, lavender and blue. Ordinarily, these tender plants were grown as annuals as they are susceptible to even the slightest bit of frost. Fortunately, you can grow them as indoor houseplants and experience the endless beauty indoors all season long. Give them plenty of bright light, good humidity and air circulation to prevent spider mites and keep plants vibrant and healthy. These fast-growing Coleus plants, also known as Painted Nettle, are members of the Mint family and are native to Africa, Asia and Australia. 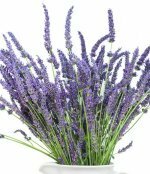 They are gorgeous on the patio when displayed in container gardening, flower pots or hanging baskets or on tables. Light: Provide very bright light near an east, south or west window with a sheer curtain. Supplement with grow lights to and help make the foliage leaf color more intense. Water: Water regularly as this fast growing houseplant and dries out quickly and will wilt if under-watered causing the leaves to have dull colors and develop crispy edges, dull colors, and brown spots. Allow the top inch or two of soil to dry out before watering again. This is necessary to prevent over-watering that results in root rot. Fertilization: Feed the plant once every week or two during the spring and summer growing season, using fish emulsion or a water-soluble fertilizer diluted to half-strength. Humidity: Place the pot on a tray with a layer of wet pebbles to increase the relative humidity if the air in your home is dry. (Never let the bottom of the pot stand directly in water.) Because a Coleus Plant likes high humidity, powdery mildew can be a plant disease problem. Temperature: Plant likes warm temperatures between 70-85 degrees; however, it can survive in temperatures as low as 55 degrees without damage. Grooming: Pinch the tips of the plant frequently to control excessive growth and keep it bushy. Remove blooms as soon as they appear, as they draw energy from the colorful foliage and weakens the plant. Soil: Plant in a quick draining, well-aerated potting soil. Add plenty of peat moss and other loose medium when growing in containers, Also, you can add sand or perlite to amend the soil if it is too heavy. Propagation: Plant is easily propagated from stem cuttings or seed You can take a cuttings from healthy new growth and place the cuttings in soft, rich soil. Be sure to keep the soil moist and covered to help the roots take place. Coleus plants are easy to grow from seed or cuttings. Sow seeds by spreading them thinly. Cover seeds with 1/8" of seed starting soil. Then, water lightly. Plants germinate and grow rapidly, if the soil temperature is kept at 70 degrees or higher (Days to Germination: 7 - 14). Pests: Check your plant weekly for Mealy Bugs, Aphids, and whiteflies. If found, spray the plant with the appropriate pesticide and also place a Yellow Sticky Insect Cards on the soil to trap flying insects. 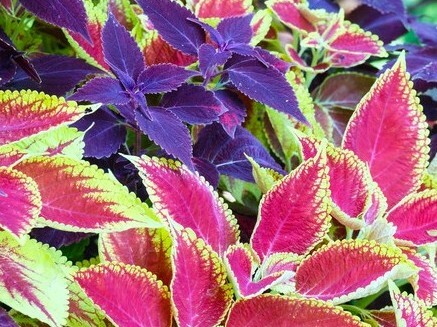 Moreover, coleus makes a beautiful addition to your indoor environment with non-stop color.